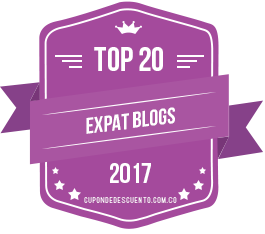 Part 2: Ten Ways that Parenting in Colombia is Different than in the U.S. | Barranquilla or Bust! Part 2: Ten Ways that Parenting in Colombia is Different than in the U.S. When you and your munchkin explore a new way of life together, adventures in parenting can easily become adventure parenting — when you’re unsure not only how to handle a given situation, but also how to understand the context in which it’s occurring. When this happens, your notions of what it means to be a good parent can seem, or actually become, up for grabs. Deer in headlights? 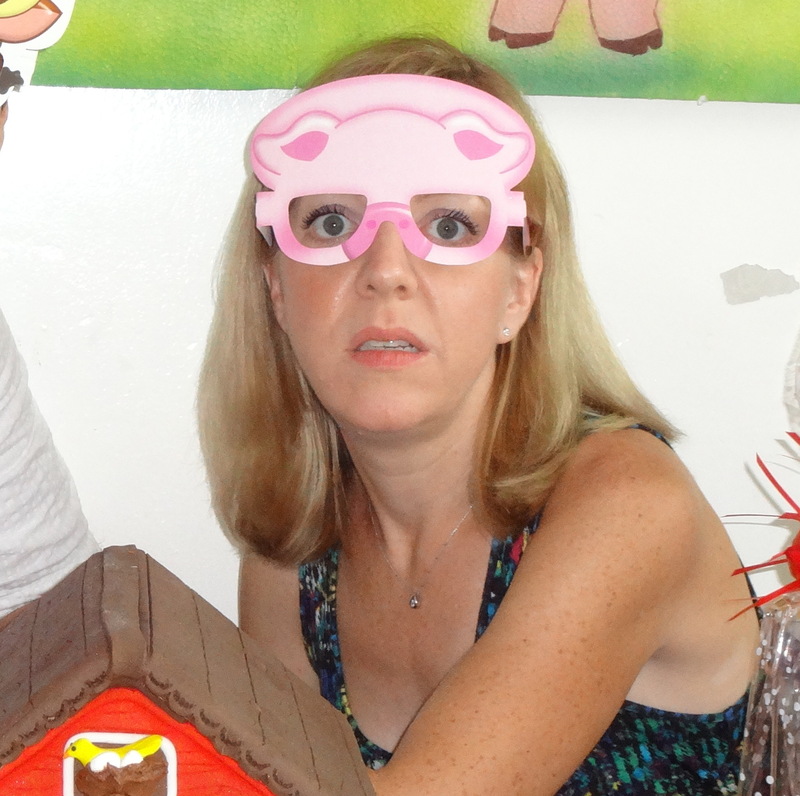 Pig in headlights? All parents at one point or another find themselves in the midst of “adventure parenting” — no international relocation necessary! Moving to a different country is just one scenario that can make adventure parenting more likely or more frequent, at least until you figure out the rules of your newly adopted culture. Part 1 of this series explored three food-related surprises that were in store for my son Marcello, my husband Gio, and me when we moved to Colombia. Here, we tackle that big bugaboo of parents everywhere: child care. 4. Your preschool or daycare center will be open mornings only. Are you shocked? I was! 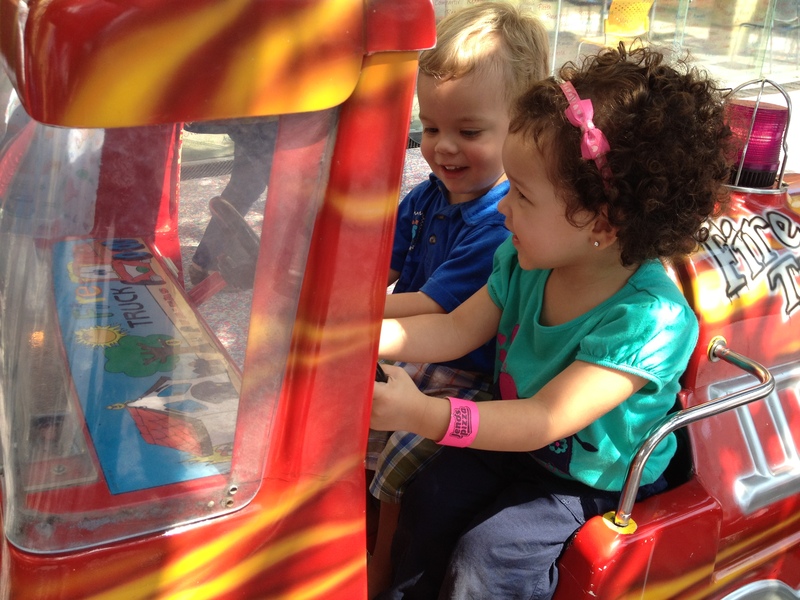 In Miami, our childcare center was open from 7:00 a.m. until 6:00 p.m., Monday through Friday. Here in Barranquilla, our center is open roughly 7:30 a.m. until just after 12:00 noon. This is the usual schedule for childcare centers here. We’re lucky because our daycare, unlike most, has an optional afternoon babysitting service. Locals tell me that the morning-only schedule is a throwback to Barranquilla’s more small town days, when it was customary for children to come home for lunch and then stay. (Businesses in Barranquilla still take a standard two-hour lunch break from 12 noon until 2:00 p.m.) The morning-only schedule does seem indicative of Barranquilla’s family-oriented culture. I think most families in which both parents work full-time hire someone to help in the afternoons or have other close family members who take over during that time. 5. Your childcare center will expect a higher level of involvement from you than is expected in the U.S.
“Mi Familia” audio-visual (okay, just visual). 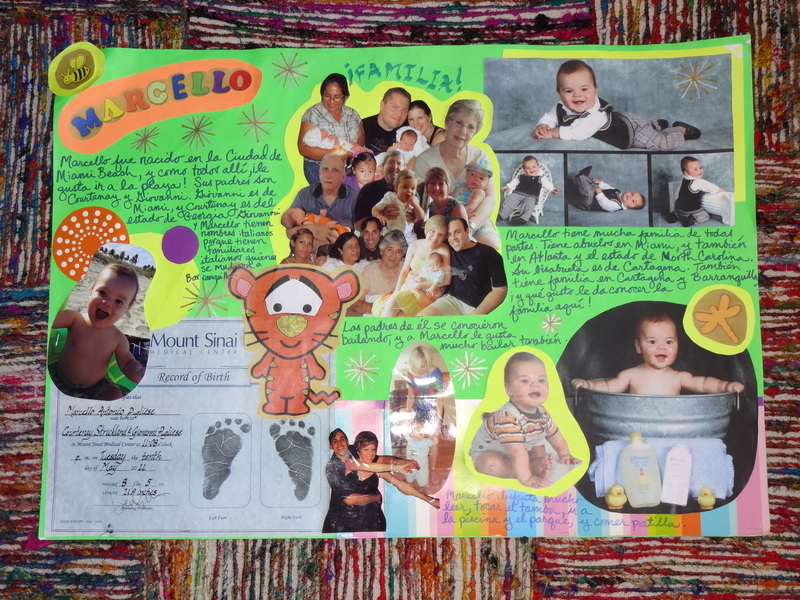 Shortly after we moved to Barranquilla in the summer of 2012, I had to give a presentation on our family history to Marcello’s class of fellow one and two year-olds. They were riveted by my stunning public speaking skills. While I didn’t have to put together a Power Point (oh, that would have been so much easier), I did have to literally cut and paste photos and apply them collage-style onto poster board. During this same week, I also had to add five pages about Marcello to the school’s official scrapbook. This was highly intimidating given that other parents had seriously bling-ed out their pages. Honestly, they stopped just short of using a BeDazzler. All this was greatly complicated by the fact that we had just moved to Barranquilla, and I didn’t know where to buy Scotch tape, much less ribbon and glitter. Marcello, working his way toward beet status alongside a friend. But the presentation and scrapbook were only the start of the requested parental involvement. Candyland (see Part 1 for more on the daycare’s name) also routinely has functions on regular weekdays that parents are supposed to attend. If a parent is unable to go, the child must stay home. Last week, neither Gio nor I were able to attend on an outing to the newly renovated Parque Suri Salcedo, and so neither could Marcello. A few weeks prior, I did manage to accompany Marcello to an outdoor party between 9 a.m. and noon, during which I was almost dissolved by my own sweat and my child turned roughly the color of a beet, albeit a very happy beet. Part of the daycare’s goal is to encourage families to spend meaningful time together. I respect this, but it’s not easy to reconcile with a work schedule. Mine and Gio’s ability to juggle the demands is complicated by the fact that there is little advance notice of these events. This doesn’t seem to be particular to our daycare; from what I can tell, two days’ notice is considered sufficient for most activities in Colombia. My Zen side is trying to convince my Type A side that this is teaching me flexibility and non-attachment. 6. Your preschool or daycare will close for a lot of holidays. Like all childcare centers in Barranquilla, our daycare closes for all of Colombia’s 18 official holidays. If the holiday falls on a Sunday — as is the case with Mother’s Day and Father’s Day here, just as it is in the U.S. — then Monday will be a day off. In addition, everything closes for the full week between Palm Sunday and Easter. Since we live in Barranquilla, the daycare is also closed for a week during Carnaval. As for Christmas and New Year’s, we are lucky in that our center closes for only a month during that time instead of the usual two (whoa). 7. You will sometimes discover that you are completely clueless. This happens while parenting in the U.S., too, but maybe not over the same things as it happens here. For example, I was shocked at how most daycare centers in Barranquilla close for nearly two full months at Christmastime. For days last December, I marveled at how long the kids were going to be home. And then sometime around New Year’s, it hit me. This is SUMMER BREAK! Now why would I not have realized that Christmas break here is the equivalent of summer break in the U.S.? For one thing, even though we are in South America, we are still four degrees (a mere four degrees, and believe me, you can feel it) above the Equator. That means our seasons – to the extent that there are seasons, which there really aren’t (Miami has more) – are not reversed the way they are in Argentina. Since I was busy focusing on how Barranquilla’s seasons aren’t reversed, it took me awhile to register that most of Colombia is below the Equator and probably Barranquilla’s school schedule coincides with the rest of the country in order not to wreak total havoc. Of course there is a big break after the end of the school year! Duh. I must really frustrate Candyland’s personnel sometimes with my utter ignorance. And so there you have it… a few more discoveries. The third and final part of this series (whew) will tackle birthdays, foreign languages, and transportation – oh my. Thank you for reading, and stay tuned! 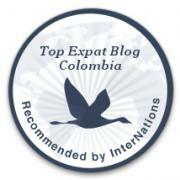 This entry was posted in Daily Life, Parenting and tagged adventure, adventure parenting, barranquilla, child care, childcare, Colombia, culture shock, daycare, expat, Latin America, parenting, south america, travel. Bookmark the permalink. My partner has a little boy, 3, who has just started going to pre-school, and it surprises me how different it is from pre-school in Australia. I, vaguely, remember spending my days as a three-year-old playing with green slime and playing dress-ups, but here they’re already onto numbers, learning English and even have homework every other night of the week. It’s incredible, but a great initiative. I spoke to some of my girlfriends who have children back in Australia and they say they just can’t imagine their kids sitting still for long enough to do homework at three! I hear you on the homework! About 3 months after enrolling him, our guarderia started sending homework home with Marcello every weekend – and he was only 1! I thought it was definitely a little early then, but it was understandable since he was the youngest in his class. Now that he’s two, the weekend homework makes sense – he learns stuff, and it does create another opportunity for family quality time. Although I did have to find somewhere to get clean sand because the activities kept requiring that we glue sand to stuff! Thanks, Aunt Nan, but we couldn’t do it either without extra help at home. That’s the subject of a whole ‘nother blog post. Thanks for reading! Hilarious!! I have totally forgotten about the 18 holidays!!! Thanks for reminding me of so many things 🙂 and i loved the show!!! Had the whole family watching! Thanks so much for checking out my blog and the show, Victoria! I’d love to hear more of your insights and perspective! Thanks for the blog!!! Working in daycare for 15 years it is a treat to hear about how other countries do it!!! I wonder if they require that dedication in the school systems too? Pingback: Visualizing the Future in Puerto Colombia | Barranquilla or Bust!